Model solutions for the May 2016 examination now available! Method of assessment: Unseen 2-hour written examination (75 %), Coursework (25 %). A set of lecture notes [AN07] (PDF), originally developed by Dr. Thorsten Altenkirch and then updated and adapted, support the lectures, along with electronic lecture slides [ELS16] for some of the lectures. Please note that you should not expect these notes to be a complete or even self-contained record of all that is said and discussed during the lectures. Lecture attendance is compulsory. The book Introduction to Automata Theory, Languages, and Computation, 2nd edition [HMU01] by John E. Hopcroft, Rajeev Motwani, & Jeffrey D. Ullman is the main reference for the course. Note that this book is quite different from the classic 1979 first edition (see below). Consult the book's web pages for additional supporting material, including additional exercises with automated on-line correction, and errata. The library has got some copies of the book. There is now also a third edition of this book. This is fine too. However, the page references below are for the second edition. 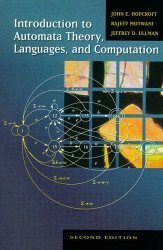 The 1979 first edition of Introduction to Automata Theory, Languages, and Computation [HU79] by John E. Hopcroft & Jeffrey D. Ullman is very thorough and a classic in the field. However, it is considerably harder than the second edition, being aimed more at PhD students or advanced undergraduates. It is now also somewhat difficult to get hold of. The book An Introduction to Formal Languages and Automata [Lin06] by Peter Linz can be used as an alternative or complement to [HMU01]. The picture shows the fourth edition. Later editions should work too. In fact, as the lectures cover standard material, but without following any specific book very closely, there are a range of possible text books for the student who wish to delve deeper into the subject than what the lectures notes [AN07] do. One important application area for much of the material covered in the course is compilers. If you are curious, you might want to have a look at the material for the second-year module G52CMP Compilers, or you might want to browse through a book on the topic, such as the classic Compilers: Principles, Techniques, and Tools [ASU86] ("The Dragon book") by Aho, Sethi, & Ullman. The lecture overview below is at present tentative. For example, topics may change a bit, especially towards the end, or the schedule might slip. Copies of electronic slides, any major pieces of program code, other electronic material used during the lectures, and useful links can be found here. Additionally, an unassessed set, covering the material of lectures 15–20, is planned for after the Easter break. The deadline for submitting solutions is 4 PM on the submission date. Solutions are to be submitted to the School office as handwritten (recommended) or typeset hard copies. Model solutions will normally be released shortly after the deadline. For that reason, and to make quick marking and feedback possible, late submission will not be considered. Extenuating circumstances affecting a single problem set are addressed by the rule that only the three best solutions count. In case of extenuating circumstances affecting two or more of the problem sets, suitable arrangements will be made. Problem sets below. Solutions will be added shortly after the deadlines. A Moodle Forum for G52MAL has been set up. The forum is intended for asking questions about and discussing aspects of G52MAL, like the coursework. It will be monitored by the G52MAL team, and we'll endeavour to answer any outstanding questions reasonably quickly. However, any one is free to contribute to the discussions and help with answering questions. Indeed, in the spirit of an on-line forum, you are encouraged to do so! Of course, we do ask that you do not post the exact solutions to the coursework! The point of the coursework is that you should ultimately solve the problems yourselves so that you know what you have understood and what you need to work more on or ask about. The exam counts for 75 % of the total mark (with the coursework counting for the remaining 25 %). 3 compulsory questions, each worth 25 % of the overall mark. The exam counts for 100 % of the mark. 4 compulsory questions, each worth 25 % of the overall mark. [ASU86] Alfred V Aho, Ravi Sethi, Jeffrey D. Ullman. Compilers - Principles, Techniques, and Tools, Addison-Wesley, 1986. [ELS16] Henrik Nilsson. Machines and their Languages (G52MAL): Electronic Lecture Slides. [HMU01] John E. Hopcroft, Rajeev Motwani, Jeffrey D. Ullman. Introduction to Automata Theory, Languages, and Computation, 2nd edition, Addison Wesley, 2001. [HU79] John E. Hopcroft, Jeffrey D. Ullman. Introduction to Automata Theory, Languages, and Computation, Addison Wesley, 1979. [Lin06] Peter Linz. 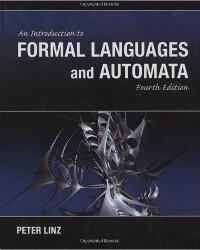 An Introduction to Formal Languages and Automata, 4th edition, Jones & Bartlett Publishers, 2006. Last updated 6 June 2016.